As athletes, we are constantly searching for the next challenge – what new boundaries will you set for yourself this year? More and more people are turning to ultramarathons as the next frontier. If you too find yourself curious about the world of ultrarunning, here are some things to consider about going over 26.2. Any grizzled old ultrarunner can attest to the power of your mind when running longer than most people care to drive. This is likely the most important aspect to consider. It takes a certain amount of toughness, both mental and physical (is there a difference?) to run ultramarathons. Discomfort, doubt and fear are often part of the game. But every time you enter the “pain cave” you come out the other end less frightened by subsequent visits. If your 50 km experience is a positive one and you aspire to try your hand at 50 miles, or even a 100 mile race, then the ratio of risk vs. reward is increased on both sides of the equation. The longer you run the higher your propensity is for experiencing these “tough spots”, but with that also comes an increase in satisfaction and feeling of accomplishment. This is the lure of ultrarunning. Let’s start with the basic assumption that it’s best to use races as stepping stones to the next, further distance. Therefore your journey to ultrarunning should use each successively longer distance as a stepping stone to the ultramarathon. Taking this measured approach means you’ll take the smallest possible jump in distance from where you are comfortably running now. So if you’ve been doing 5 km races, train for a 10 km race. From 10 km go to a half marathon and so on, until you’ve finished a marathon injury-free. At this point you are ready an ultramarathon distance. There are few exceptions to this rule and most attempts at breaking it result in a broken body. Let me say it again: If you have successfully finished a marathon injury-free, you can in fact most likely run an ultramarathon. The logical step up in distance from a marathon would be a 50 km race (31.1 miles), at just five miles longer than the marathon. Know that moving up in distance will take a bit more time and fortitude. But the longer your running history the the easier this transition, or addition in miles, will be. If you thought training for a marathon was a chore, then you might want to reconsider training for an ultra. There are certainly ways to mitigate the time commitment (like having a training plan), but it can’t go unnoticed that a certain “addiction to miles” and the time required to feed that addiction only helps your cause. As your distance goals increase, there is generally less focus on pacing and more focus on overall volume/miles/time on foot. Training for an off-road ultramarathon brings with it training on trails, which means pace becomes a less effective way of measuring effort. So as your training moves to the trails, your training schedule will change to perceived exertion or heart rate guided, time-based runs. Ultramarathons are long, so you are going to have to figure out a solid nutrition and hydration strategy. Failure to do so often results in failure to finish. Your body has stored energy in the form of muscle and liver glycogen. This is the energy reserve that allows you to run for 1.5-2 hours without taking in any fuel. This is adequate for short distances, but won’t serve you well when your race is a 4-7 hour long 50 km. So buy some gels and start figuring out what your stomach can handle during your long runs. There isn’t anything different happening to your metabolism rate once you pass the 26.2 mile mark; however you are definitely running low on your body’s stored energy (glycogen). So from the start of the race this means consistently consuming calories. Karl Meltzer, who has won more 100 mile ultramarathons than anyone else, fuels almost exclusively with energy gels in a 100-mile race. For most of us however the thought of eating 65 gels during a race is repulsive. So variety is key. Get most of your calories from what works best and is easily digestible, which is usually gels or powders. Then supplement that with other tasty treats like fruit, energy waffles and bars. For the longer ultras some real food options become very appealing. Two of my favorites are baked yam/apple, and avocado wrapped with turkey. Make sure to test your fueling strategy out during your long training runs, to mitigate the unexpected. As for hydration I think Dr. Timothy Noakes (The Lore of Running) has it right regardless of the distance: “Drink to thirst, that’s it”. However the longer the race, the more time there is for you to develop hydration issues. So be smart and consistent and don’t allow yourself to get behind. You can usually come back from a bonk, but true dehydration or hyponatremia could end up in a hospital ride. The free-spirited 5K or 10K runner who heads out with only a pair of short shorts might find the required equipment for ultrarunning a bit daunting. The gear is in fact improving leaps and bounds year to year (check out UltrAspire). The unfortunate fact though is that at some point while training or racing you’ll have to carry calories and water with you. This will require a hydration backpack or what we ultrarunners call “handhelds”, which are simply bottle holders that attach your bottle to your hand. At some point in your progression, like a Jedi and his light-saber, you will not be able to leave the house without taking your handheld with you. At this point, “You are almost ready, young Jedi”. Most ultramarathons are run on trails as opposed to roads. This change of scenery brings with it a natural antidote to the boring monotony of road running the concrete jungle. It also means hilly undulating terrain, worse footing, mud, and wonderfully technical trails. Fret not if you come from a road background and have an aversion to exposure, there are plenty of ultramarathons on flat tracks and bike paths. However, my bet is that you will at some point fall in love with the rugged remoteness of “real” trail runs. You aren’t entirely alone out there either. All ultramarathons have aid stations where there is usually food, water and first aid. It’s just not available as often as during a road race and depending on the location, might not have as much variety. Check out the video below for an example of some of the terrain you could encounter ultrarunning on trails. Ultrarunning is in fact a labor of love. Truthfully, the only real prerequisite for an aspiring ultrarunner is a love of running. Being able to cover vast distances on your own strength is simply one of the most empowering feelings there is. The accomplishment will open doors for you mentally, proving the limitless capacity of perseverance and determination. After all, once you’ve run that far – is there anything you can’t do? Matt Hart owns and operates'Coaching Endurance LLC, through which he has helped hundreds of athletes reach a wide range of fitness and endurance goals.' Initially USA Cycling Certified as a coach, Matt now works mostly with runners and multi-sport athletes. He's driven by an incessant curiosity and passion for endurance training and racing. Located in the Wasatch Mountains of Utah, Matt coaches athletes all over the world. 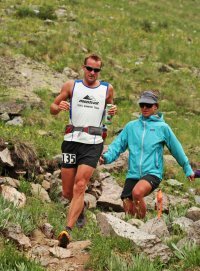 He's also living what he preaches as a professional ultrarunner and ski mountaineer for Mountain Hardwear and Montrail. For more information on Matt check out his'Coaching Endurance Blog, or follow him on Twitter'@TheMattHart. 'To read more from Matt you can also pick up'Trail Runner Magazine, where Matt writes the "Ask the Coach" column in each issue.